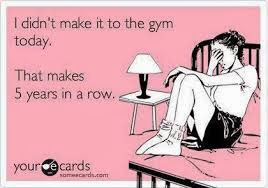 As much as I love going to the gym, I also hate it. It's too expensive and there are too many people, but when I don't go I miss it. It's not that you have to talk to any of the people in there but it is kind off intimidating when you do your exercises and people might watch you or walk past. Puts to much pressure on me ;) Probably no one even looks at me, as every one is caught up in surviving there session and making the best out of it. I relaxes me though and gives me time to think about things and actually be in my own world with my own music for a while and I get some quality "me" time. It also does make me do my exercises properly and without stopping. It's a big commitment for me to sign up as sometimes I just can't go for a week or more in a row, plus I really like to try out different classes which they don't offer in gyms. Every year just after Christmas I sign up to the gym to go a few times, then get lazy and cancel the membership after a few month again. I find it easier to exercise at home, as it doesn't waste that much time with travelling and getting changed and all. Only thing is I get distracted very easily, so I have to switch of my phone and also the TV. It doesn't cost much to train at home. You can get some small equipment to make it more interesting too. I think if you have kids, not enough money or simply just want to save money but still stay in shape or tone up then training at home is a really good alternative to the gym. Make yourself an exercise plan and get into a routine. Try to change it once in a while so it doesn't get too boring. Me and my flatmate want to get some home trainers, so that instead of just sitting TV we can do some exercise and enjoy each others company this way. First we want to get a rowing machine. You can sit and just push backwards and forwards and still watch telly. Also it doesn't make too much noise, so we won't annoy the neighbours. Before I trained to become a fitness instructor I never really liked to use it as no one explained it to me and I did not want to look like a fool in the gym. but now I do it for 10 minutes to warm up and I really feel great afterwards. It makes you work really hard. 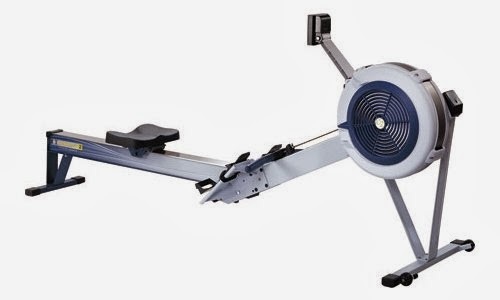 The rowing machine requires you to use many major muscle groups which means it is an effective way to raise your heart rate and increase your oxygen uptake (VO2 Max). 2) It works your whole body, I can even feel it in my abs and lower back. The second "home trainer" we'd like to buy is something more unusual. It's a magnetic stand for the "outdoor" bike. It's a machine which makes your "normal" bike into a "Spinning" bike. These magnetic bike trainer stand comes in different styles and with different functions but they are all more or less the same. The price for these vary a lot. Just like with any other home trainer i suppose. I will get mine off Ebay, I think, but Amazon sells them as well. I even saw it in Halfords the other day. The ones I was looking at cost about £60 Pounds. But I have not yet decided on which one to get. It won't replace the good old Spinning® bike which I love so much, but is a cheaper alternative to it. I already have a bicycle which I never use and before I sell it I'll use it indoors instead. 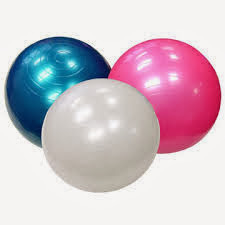 Other equipments could be the exercise ball, small weights, exercise bands or you can simply just use your own body weight. I would also definitely get an exercise mat, as it is more comfortable when you do the exercise on the floor. But I guess it always depends on what sort of training you're after. If you really want to bulk up, you could get those weight benches and very heavy weight. I would rather got the gym for that though. There are so many different things you can do from home or even in the park. And it really doesn't cost the world. And if you are not sure which exercises you should or could do or how to do them, there are so many fitness DVD's already and after you done them a few times you'll remember the exercises and can do them by yourself. In my class which I teach on Thursdays (Legs Bums and Supple Strength), I try to show and explain the exercises properly so that people could go and try them at home again. I recently started to do the fitness DVD from Tracy Anderson. I got this DVD set for my Birthday from a really good friend and I must say I LOVE it. I am using a few of these exercises in my class now and I feel they are really working. My whole body is soar after I did the whole 50 mins. Tracy trained Gwyneth Paltrow and Madonna and loads of other celebrities. I am planning on doing a few posts on exercises for a specific areas, So you have more variety for your workout at home. What is your favourite exercise? Do you train at home or prefer the gym?